If you have inactive contact records that you don't want to delete, but don't want to have count against your database limit, you can archive them. 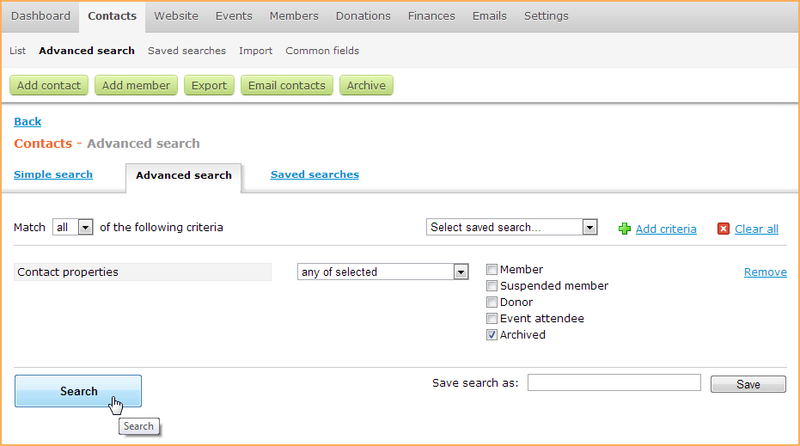 Archived contacts are automatically excluded from email blasts, including automatic event notices. 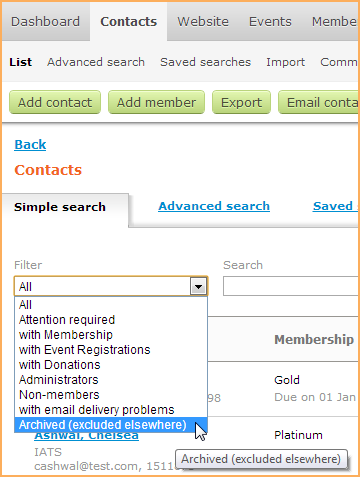 However, an archived contact is automatically restored when he or she logs in to your Wild Apricot site. Archiving is the first step in deleting – permanently removing – a contact from your database. An archived record – unlike a deleted one – can be restored at a later date. A record can be archived and restored as many times as needed without any loss of data. Contact records can be archived one at a time or in bulk, either from your contact list or using Wild Apricot's import and export options. For more information, see Deleting and archiving contacts. You can also suspend a contact. Suspending a contact strips them of membership so they become a non-member contact. For more information, see Suspending a membership. There are several differences between how archived and active records are treated in Wild Apricot. Counts towards contact database limit? Automatically excluded from email blasts? Once a contact record has been archived, the Archive button on the contact details is replaced by a Restore from archive button. You can also restore archived records in bulk using Wild Apricot's exporting and importing functions. Within the spreadsheet, set the Archived column to No. If you want to restore their membership as well, set the Membership enabled column to Yes.